Spot silver followed gold higher reaching an intra day of $23.95 per ounce before pulling back to trade at time of writing at $23.89 per ounce as spot silver continues to respond to yesterday’s release of the FOMC minutes. At the moment the markets are buying the rumour which if it is to be believed will see the FED implement phase 2 of its quantitative easing programme by buying its own debt in an effort to kick start the US economy and prevent further increases in unemployment. 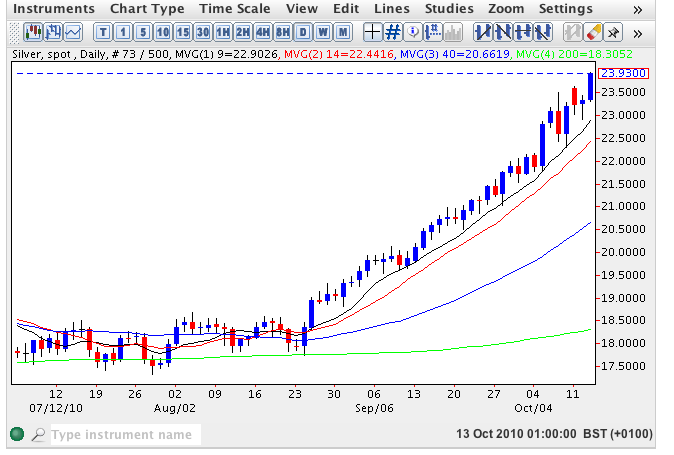 From a technical perspective the daily chart for spot silver is a text book example of a breakout and trend development with the long sideways price action of the summer months producing the coiled spring effect of a dramatic move higher. In many ways this upwards momentum at present is alarming and somewhat atypical as we would normally expect to see such a trend develop with a series of higher highs and higher lows as the market pauses in its upwards journey. As such some market commentators are predicting an equally spectacular fall in spot silver. At present there is no sign of this with silver benefitting from the triple whammy of a pull through effect from gold, the adoption of the metal in its own right as a safe haven, and finally the pull through effect from equities which have surged once again this evening both in the UK and the UK with the Dow trading at time of writing at 11141.42.